Homages are a hot button topic on watch design. It seems that the consensus is, as long as the homage is an out of production vintage design, most people seem to find that ethically acceptable. Some do not of course. The moral objections come down to that some people believe that ripping of a hot popular design devalues a brand, cheaply exploits another firms’ efforts, and steals sales from the real watch. I think there is some truth to this line of thinking but I also think a lot of it is based on some shaky assumptions since there isn’t a way yet to realistically measure the effects of a homage design on a current production watch. Certainly for vintage watches it keeps that history alive in the modern conscience and the elevates the value of vintage pieces because eventually we all want the real thing if you’re into this hobby. That is the other aspect of it. Homages are typically priced significantly less than the watches that they’re copying. Since watch collecting is a strongly emotional hobby, nobody ends up being truly happy with that ownership experience. We all want to own our original works of art, how happy can a print really make you over the long term versus an original piece? 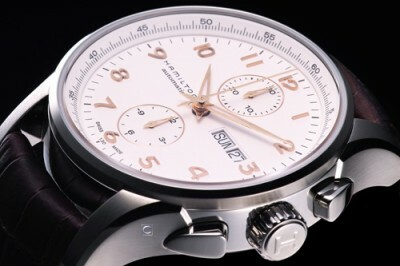 Hamilton is currently owned by the Swatch Group. 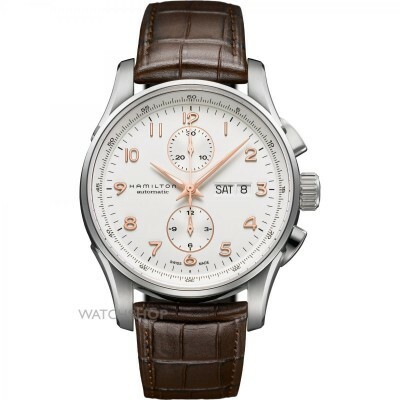 I ran into this watch while researching some of the other excellent Hamilton Jazzmaster Chronograph line. What watch does this remind you of? Personally, I don’t think anyone can objectively say with a straight face that one didn’t begot the other. Sure, Hamilton added a day/date, changed the pushers around and used a different font but come on. This also goes to show how perfect the IWC design is since it’s still just so much more elegant and beautiful than the Hamilton. Again in this case, I don’t think anyone buying that Hamilton is really stealing a sale from IWC considering the IWC is nearly 800% more costly. However, it does give Hamilton sales that feel somewhat undeserved although it is addressing a market need for people who want a downscale Portuguese Chronograph and for that, I can’t really blame them.